D E S C R I P T I O N : The sculpture will be made to order and constructed to be ten to twenty feet tall. The figure will be mounted to the ground using bolts—hidden underground or directly to concrete. It will be my intent to work with the existing landscape, bringing in natural stone or plants to enhance, if needed. As a professor of art (at Stephen F Austin in Nacogdoches), my passion is in education and as an artist my passion is in sculpture. I feel that public art envelopes both of my passions in that public art has the ability to teach and be a viable and important form of artwork. Public art has become my passion for a multitude of reasons: it’s accessibility—it brings people who may avoid the museums and galleries into the fold. By placing it in the public realm, passersby are exposed to artwork they may not otherwise ever see—live and in person. They determine if they want to keep walking, stop, engage, or even take a selfie. They decide what they think about it and if they are going to share it with others. In doing this you can educate people and maybe even convert them into art lovers. As I hope you can see from my samples, I strive to create art for everyone. It is very important to me that my art is accessible on some level by every viewer, across all generations, education levels, aesthetic preferences, economic, and cultural backgrounds. My intention is to provide just enough information, allowing for a narrative without delving into total non-representationalism. Leaving room for interpretation as well as a little mystery, I hope, adds to the viewing experience. My work in graphic design and general fascination with pop culture are heavy influences on my work. The proposed site itself (when already chosen) is always a wonderful inspiration, and I look forward to talking to the committee members and working together to develop the best work to fit the space. 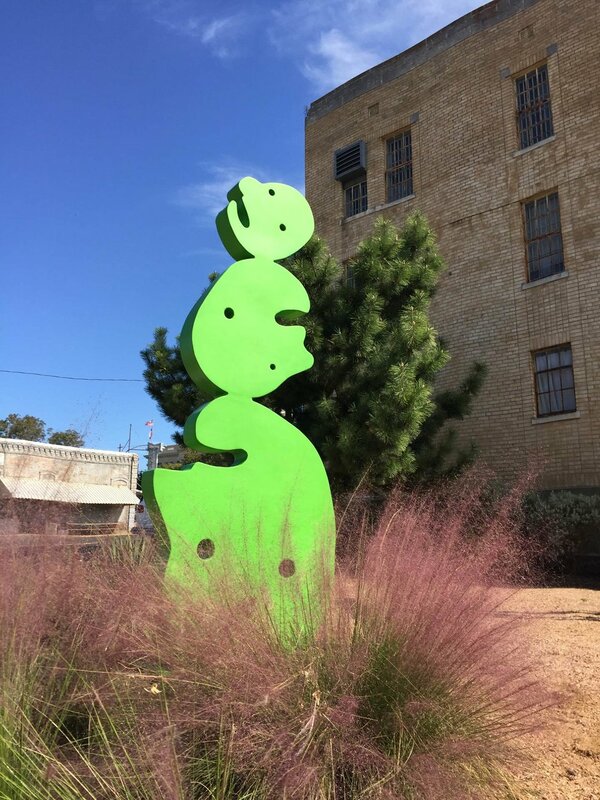 My work in welded steel is easily maintained, very durable and sometimes quite colorful, working well within a variety of environments and overcoming many expected concerns including climate issues and vandalism. Having artwork all over the US and Canada, I can say this medium and approach just works great for public art! The St. Joseph Avenue and Ladera Drive site would especially lend itself to my abstracted animal forms.